GableGotwals attorney Oliver S. Howard has been given the distinct honor of being inducted as a Fellow of the American College of Trial Lawyers. Although there are currently almost 5,800 Fellows across the U.S. and Canada, membership can never be more than 1% of the total lawyer population of any state or province. Oliver is the sixth member of GableGotwals to be admitted as a Fellow. Other Firm members include David L. Bryant, Sidney G. Dunagan, James M. Sturdivant, Jack N. Hays (retired) and Charles C. Baker (retired). 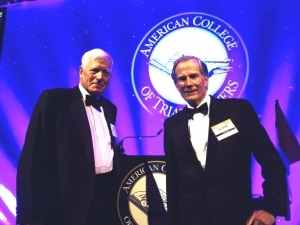 The American College of Trial Lawyers was founded in 1950 as an organization to recognize the very best of the courtroom bar. Membership is composed of qualified lawyers from all branches of trial practice. They are selected from among advocates who represent plaintiffs or defendants in civil proceedings of all types, as well as prosecutors and criminal defense lawyers. The primary constant is that Fellows of the College must have proven themselves in actual trial practice. There is an intensive vetting process and membership is by invitation only to persons who have distinguished themselves in trial practice for at least 15 years and who are recognized leaders in their local communities. The College looks for lawyers who are considered by other lawyers and judges to be the best in their states or provinces, lawyers whose ethical and moral standards are the highest, and lawyers who share the intangible quality of collegiality. The College is the only organization in which all Justices of the United States Supreme, court and all Justices of the Supreme Court of Canada are honorary members. Fellowship is extended only by invitation, after careful investigation, to those experienced trial lawyers who have mastered the art of advocacy and whose professional careers have been marked by the highest standards of ethical conduct, professionalism, civility and collegiality.